At Roseau, Dominica in November 2015 Windward Islands declared on 24 for 7 on the first day of a four-day match against their Leeward neighbours. The action was, it was reported, ‘prompted by concerns over the state of the pitch’ with perhaps a note of protest too (one thinks back to Bishen Bedi, forty years ago) and rather backfired, as they lost the match by eight wickets – perhaps not unsurprisingly. It didn’t register with me at the time and I doubt if it did with many outside the Caribbean. But Wisden spotted it, and it duly makes page 1536, the very final page of the book, under ‘Index of Unusual Occurrences.’ And it’s not the worst idea to begin at the end. The long-running annual started by the eponymous retired all-rounder more than 150 years ago has always been good at picking up on the strange and unusual, and listing them is a recent development which provides for perfect ‘dip-in’ material. Some of them you may recall – ‘England batsman refunds spectator’ for instance. It is a book of the cricket year, but it has always been much more than that. In its early days it used to come out in time for Christmas, but that was a time of few overseas Tests – series taking part between the end of the English season and the end of the calendar year are now included, when they never used to be. Indeed the last international fixture to be included, so far as I can make out, is the fifth ODI between Australia and Pakistan on 26 January this year. ‘Books are back’ ran the theme of several pieces in recent weeks, suggesting that sales of ‘e-books’ are in decline – though I suspect that in this case the printed page has never really gone away. The almanack is available in that form but I imagine that the sales are dwarfed by those of the physical book (and presumably the hardback in most cases, as both the softback and large format versions are not widely stocked in bookshops and are much more easily obtained from the publishers). Most of the people who bought this year’s offering will have bought one before – they might, like me, have a few decades’ worth – they might even have a full set. There are more in existence than you might think. So, what are these loyal customers getting for their money? All of the regular features are present – Notes by the Editor, in which Booth begins by referencing England’s trials in India and their captaincy issues; Retirements; the England team in 2016; Cricket Books; Obituaries and several pieces contributed by guest writers, including a very perceptive one by Derek Pringle on ball-tampering, and a celebration of ‘Sixty Years of Test Match Special’ by former editor Matthew Engel. The obituaries have long been my favourite section – people tend to regard someone who says that a little strangely, but of course there’s nothing at all morbid about that – these are beautifully written pen-portraits celebrating the lives of notable cricketers and cricket people; the cause of death rarely mentioned except when it was premature or unexpected. Among the great and good this year is the original ‘Little master’ Hanif Mohammad, who we are reminded at the other end of the book was one of the Five Cricketers of the Year in 1968. This of course is another perennial, indeed one of the talking points at the time of publication – Chris Woakes is probably the least surprising choice, and he is joined by Ben Duckett, Toby Roland-Jones, Misbah-ul-Haq and Younis Khan. 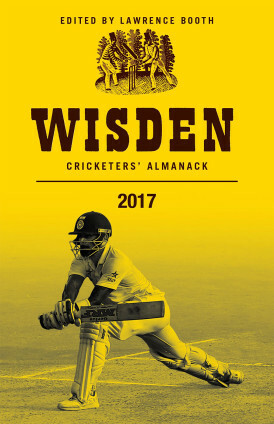 It is difficult to assess the importance of Wisden in an IPL world. Booth probably realises that average reader – male, middle-aged, often long on memory and short of hair, is not eagerly tuning in to see Royal Challengers Bangalore take on Pune Warriors, even with the involvement of England players. He covers the tournament, and the various others around the world, as fully as most of his readers would wish, but the emphasis is on English cricket, county and national – not that overseas series aren’t given far better coverage than in days gone by. The Record section and Births and Deaths are still here too. I confess I seldom refer to either these days, though it is pleasing to be reminded that England now hold the world 50-overs record, set last year against Pakistan, and also that Ray Illingworth is set to turn 85 on general Election day. Indian fans crowing about last winter’s series (and Virat Kohli is a deserving choice for the cover picture) will see that the win record still stands 43-25 in England’s favour; in England it’s 30-6 to the hosts. If not destined to be remembered as a classic, then, the 2017 edition does all its regular readers would wish for. Clearing another two inches of bookshelf space will, I have no doubt, prove to have been a worthwhile endeavour. A book that flew under the radar, released with no real fanfare, what did Stuart think of this underrated publication.